I have beans picked and drying for next year's seed. 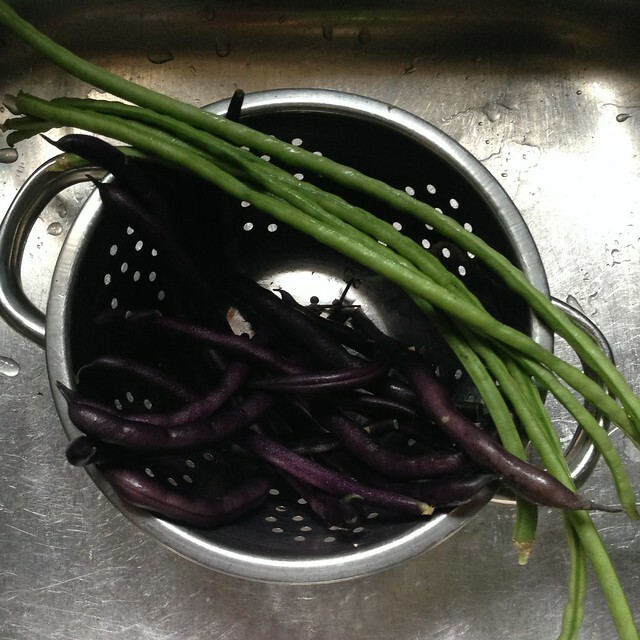 Purple Queen Beans, Scarlet Runner Beans, and Yard Long Beans. There are also some type of black bean but those are already shelled. The dried pods look very different than the fresh beans shown below. Other seeds that I'm saving inclue four different kinds of tomato, watermelon, dill, carrot, and parsnip. There will be others but that is what I am working on drying and packaging right now. 2. Drying herbs and vegetables for winter. Hubby chopped all the celery and laid out the leaves ever so neatly to dry. The celery stalks got frozen. I ran the amaranth through an old-fashioned flour sieve to filtered out stems and flower debris. It's spending 2 days in the freezer in case its harboring pantry moths. 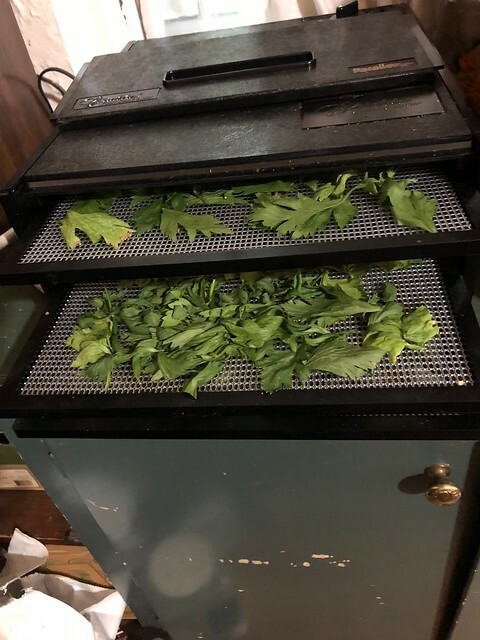 Then I ground and packaged all the basil that was already in the dehydrator. 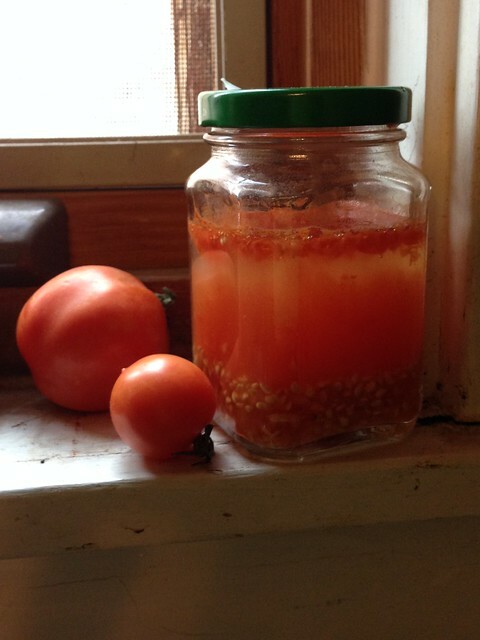 A small batch of tomatoes was dried and put away as well. Here's an older photo. 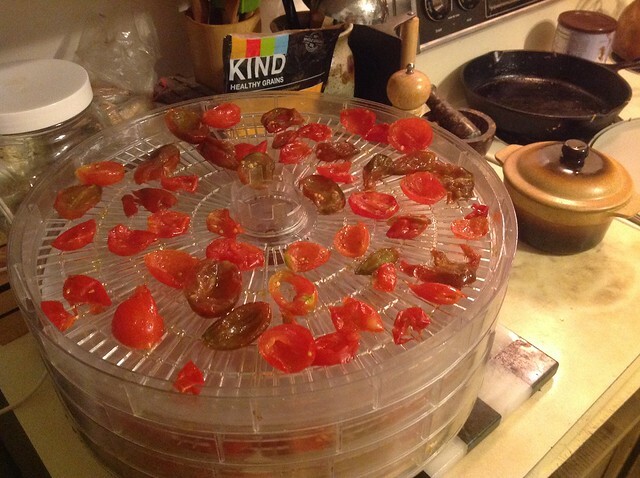 That Snackmaster Jr was a poor dehydrator because it lacked temperature control. It's been dead a while now. The trays are still useful. I am the Baker in the family. 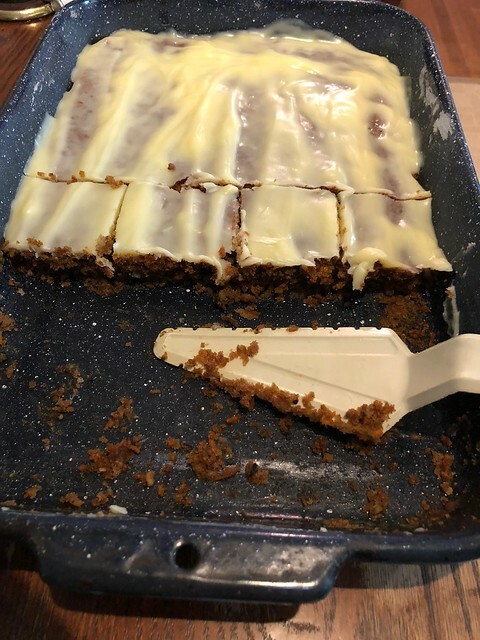 I made carrot cake with cream cheese frosting. I love baking but sadly anything with eggs in it doesn't love me. Since our oven is in bad shape, I went for a thin but large pan so that it cooked evenly. By cutting two pieces and stacking them, it gives you the same effect as a layer cake. Most nights, Chronographia cooks, when she's home that is. 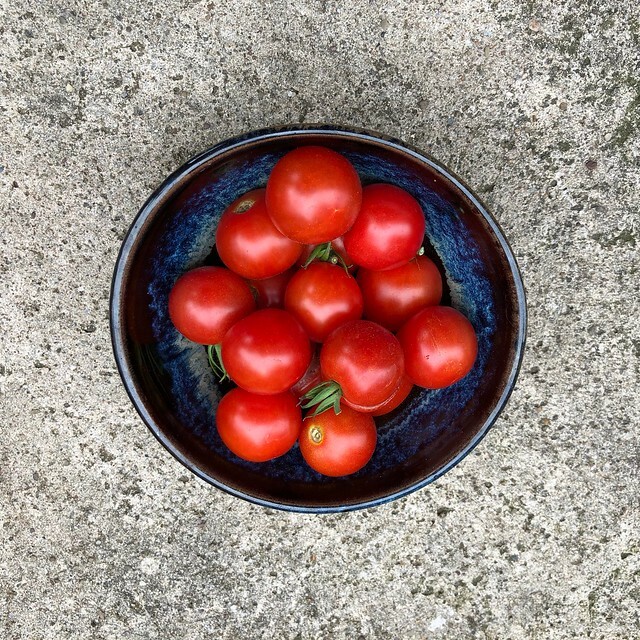 She turned our tomatoes into dinner. There used to be a show called Bitchin Kitchen on the Food Network. 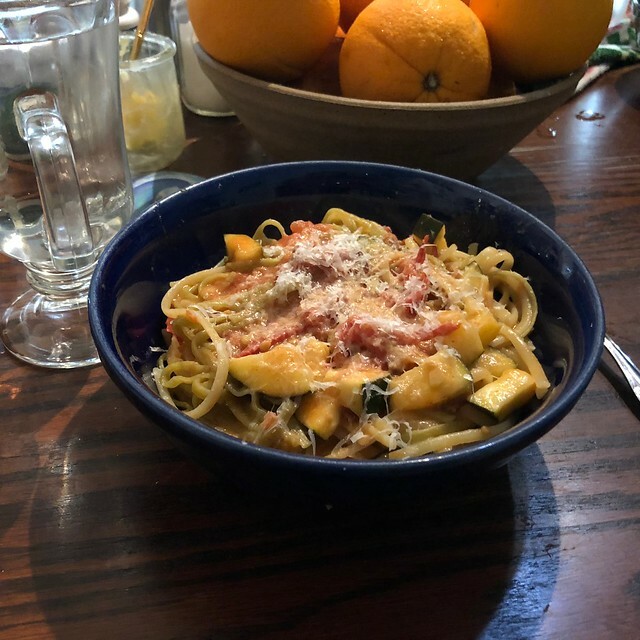 She learned how to make this pasta. We call it Nadia's pasta, after the host of the food show. 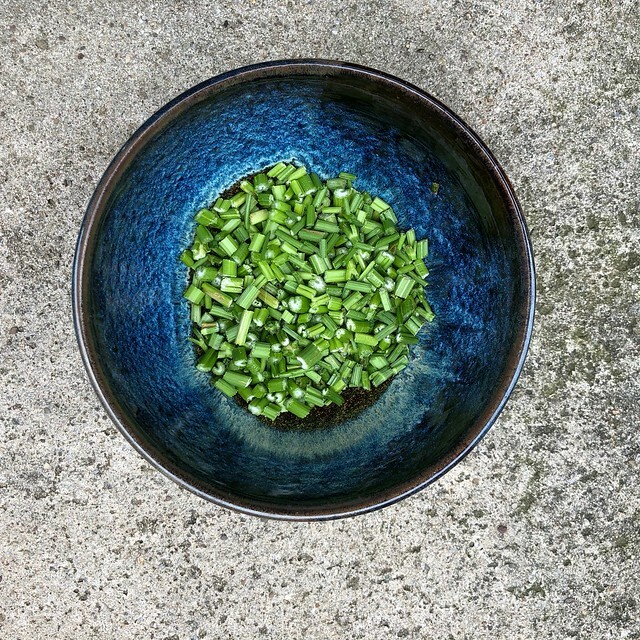 It goes great with asparagus or zuchini. We have zuchini. Chronographia is also in the process of making sherbert for the next heat wave. Right now its cool out, about 65° which is quite a switch from the 100° days. Within a week, the temperature is supposed to go up again, maybe upper eighties. We are watching the upcoming tropical storms carefully. There is a reason we don't do outdoor September shows. From Allison to Nate, we've lost a lot of merchandise and equipment over the years. Last year, we lost a tent and bent two displays. Artists all over are having a rough weekend. Renegade in Chicago had wind gusts, destroying tents; A Fair in the Park as well as the Pittsburgh Renaissaince Faire closed due to flooding this weekend. So be careful out there folks! I'm sure I can find more things to do tomorrow while it rains. We have movies from the library to watch while we knit if nothing else.